I am getting so excited for Valentine’s Day! How about you? Valentine’s Day was always one of my favorite holidays as a kid. I just love the pretty colors. I mean, how can you go wrong with red, white, pink, and purple?!? And then, of course, there is all the yummy candy. Valentine’s Day is truly a chocolate lover’s dream right? My dad always bought my mom a big heart of Fannie May chocolates and my siblings and I knew that my mom would open up the box and offer us our pick! And then there was the excitement of choosing which box of Valentine’s cards you would get to fill out for your friends at school. I loved the sparkly cards the best and always saved those for my best friends. Then we would all decorate a kleenex box to hold our treasured cards in at school. I couldn’t wait to open all my pretty cards. I would take them home and look at them over and over again. Valentine’s Day just makes me nostalgic. So I love celebrating with my own kids. We have been baking up a lot of yummy treats together lately. 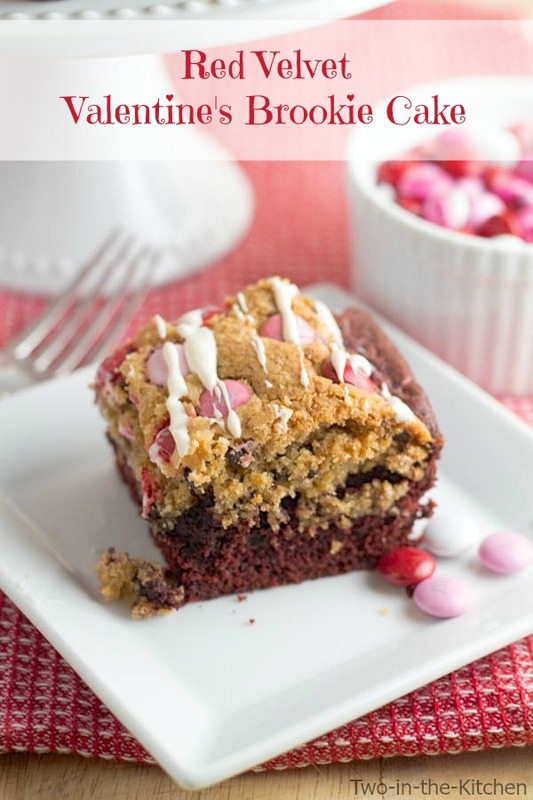 And this Red Velvet Valentine’s Brookie Cake is one of my favorites. I made it in a pretty Wilton heart shaped pan that I found at Target. You could, of course, make this in a regular square pan but the heart shape just makes it all the more perfect for the holiday don’t you think? Red Velvet is one of my favorite flavors and since Valentine’s Day just lends itself so well for it, I just can’t seem to get enough Red Velvet lately! 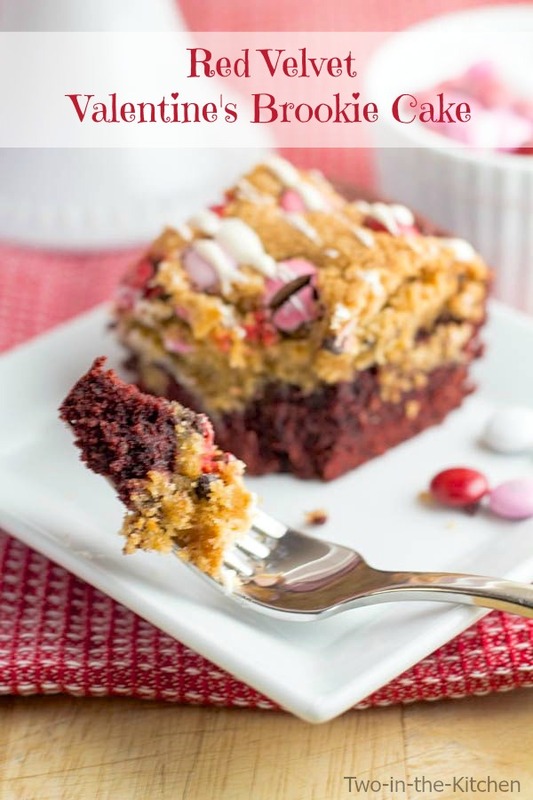 This Brookie cake is so easy to make! I started with a box of Duncan Hine’s Red Velvet brownie mix for the base, topped it with a cookie layer, and then garnished it with pretty M+M’s and cream cheese glaze. 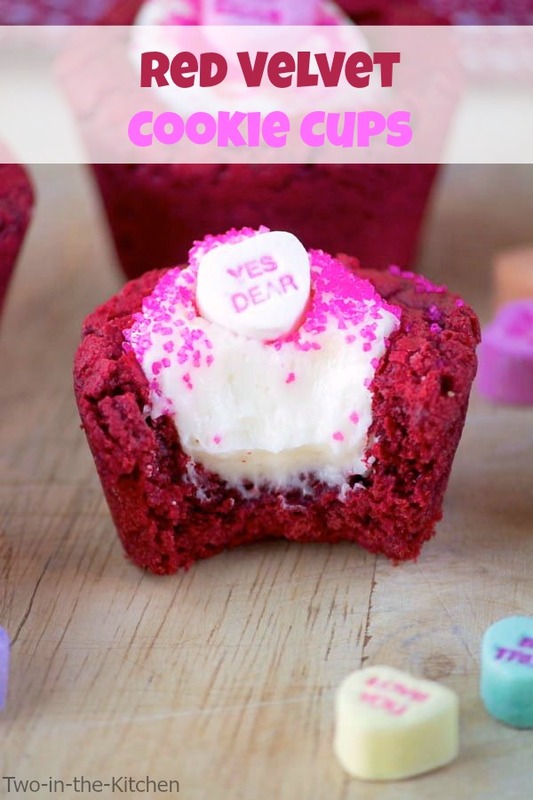 The flavors turned out perfect and the look is just pure Valentine’s! First make the brownies by mixing the first 4 ingredients in a large bowl with a wooden spoon till well blended. Pour the batter in the prepared pan. Put the cream cheese glaze from the brownie box aside. In a large mixing bowl, cream together the butter and two types of sugars, add the egg and vanilla and mix well. Add the flour mixture in two additions and mix well, scraping down the bowl as needed. Using your hands, take out a handful of dough and flatten it on top of the brownie mixture, allowing the red edges of the brownie mixture to show. Press the M+M's onto the top of the cake. For a heart shaped pan or square pan, Bake in the oven for 50-55 minutes at 325 degrees or until the cake no longer jiggles in the middle and a toothpick comes out clean. For a 9x13 pan, bake the cake for 30-35 minutes at 350 degrees or until it is no longer jiggly and a toothpick comes out clean. Remove from the oven and place on a cooking rack. Once fully cooled, drizzle the reserved cream cheese packet over the top and serve. I love this giant heart shaped brookie! I have made a lot of brookies over the past year and they so awesome! Cookies and brownies and oh yum!! 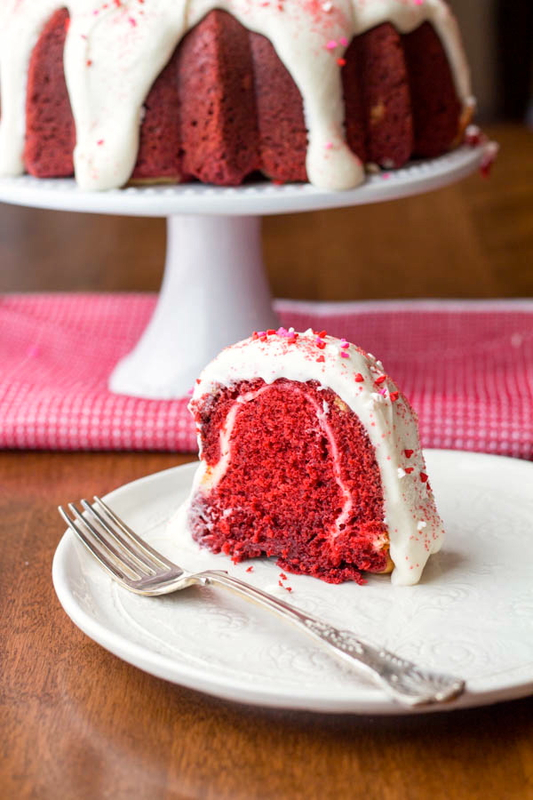 Anything with red velvet is just perfect for Valentine’s. This cake looks so delicious and I definitely wouldn’t mind receiving a slice on Valentine’s day! I love brookies — the best of both worlds! 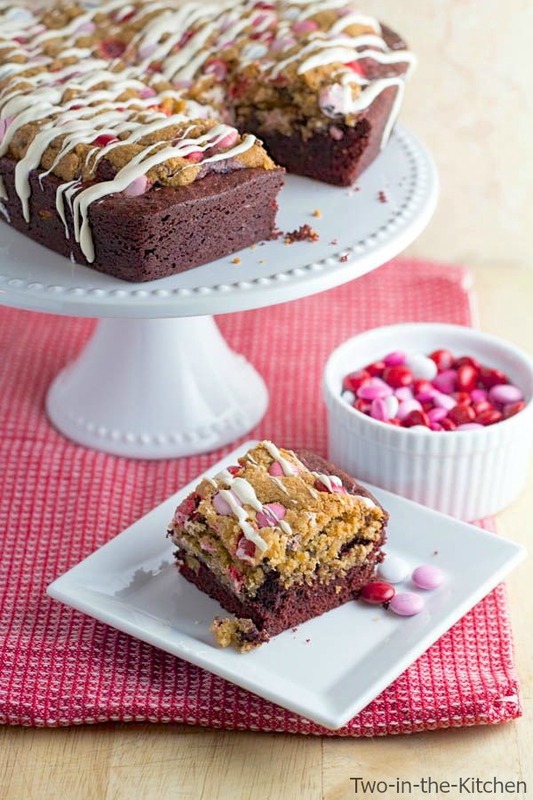 I adore red velvet brownies, and combined with chocolate chip cookies, this is one perfect Valentine’s treat! This is absolutely adorable! Perfect for Valentines Day! Valentine’s Day is so much fun to celebrate with everything being pink and red! This cake looks absolutely gorgeous, Renee! 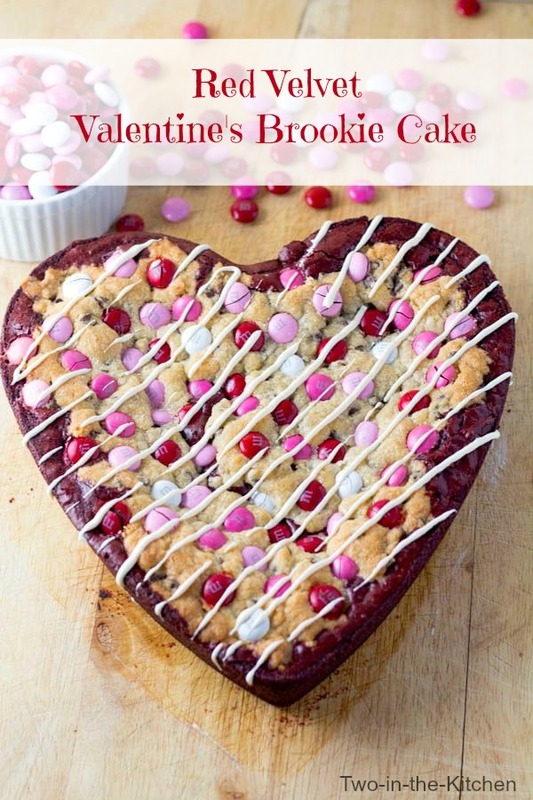 I love that it’s a brookie cake and in the shape of a heart. So fun and festive! OMG this is so cute!! And I love all of the colors!! Totally getting me in the Valentine’s Day mood! So perfect for Valentine’s! Enjoyed reading your memories of Valentine’s Day from your childhood! This looks so delicious, and I love the dual-layered effect! It’s so pretty with the red velvet poking through the bottom. This brookie cake is so pretty, Renee! I love that it’s heart-shaped and the double layers! So festive and perfect for Valentine’s Day! These look fantastic and I’d give an arm and a leg for one right now! Pinned! Mmmm love me some Red Velvet anything and tis the season! Plus I’ve never had a Brookie so I totally need to try this! Great idea! 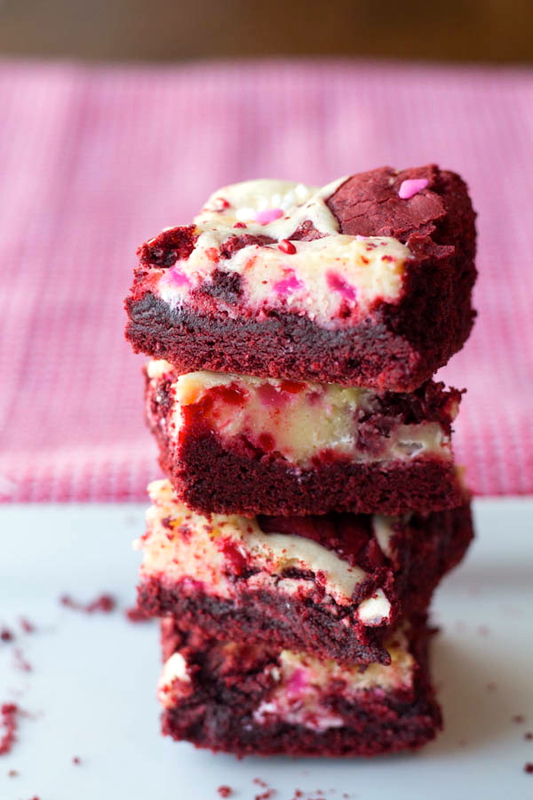 I’m always a fan of brookies, but add red velvet and wow! Would it be ok to use a roll of cookie dough instead of making the chocolate chip cookie dough? Wondering if anyone tried that and if it is same consistency/appearance. I haven’t tried that personally Joline, but I am sure it would work fine. Cookie dough is cookie dough after all!! 🙂 It might be a bit of a different texture but I am sure it would work fine. Good luck!